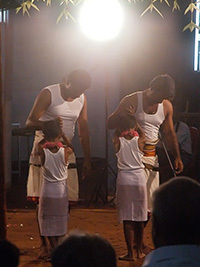 Kuthiyottam is probably the single largest and unique Vazhipadu(devotee offering) prevalent in Kerala, or in any part of the country, in terms of the expenditure involved. According to the present circumstances and market conditions, the expenditure for even a minimum scale Kuthiyottam runs to at least Rs.Two to Rs.Three lakhs. There are instances of devotees conducting Kuthiyottams by spending over Rs. 5 to Rs.15 lakhs. It is believed that it is compulsory to feed all those who visit the house to witness Kuthiyottam, and a major portion of the spendings are on this department. A big lunch feast is also offered for the people of Kara on the eve or on the Bharani day. Kuthiyottam is in fact a ritualistic symbolic representation of human ‘bali’( homicide). Folklore exponents see this art form, with enchanting well structured choreography and songs, as one among the rare Adi Dravida folklore traditions still preserved and practiced in Central Kerala in accordance to the true tradition and environment. Typical to the Adi Dravida folk dances and songs, the movements and formations of dancers (clad in white thorthu and banyan) choreographed in Kuthiyottam are quick, peaks at a particular point and ends abruptly. A few exponents also cite similarities for Kuthiyottam in Padayani, another popular folklore of Central Travancore. Similarly, the traditional songs also start in a stylish slow pace, then gain momentum and ends abruptly. Kuthiyotta Kalaris’, run by Kuthiyotta Asans (Teachers or leaders), train the group to perform the dances and songs. Normally, the training starts about one to two months before the season. The songs are mainly in four rhythms, popularly known as ‘Padams’, and it is compulsory to sing all the four Padams every day. The songs elaborate on the great deeds of Bhagavathi, how she killed Asuras like Sumbani Sumbas, Darika etc., and aims to please her by singing her virtues. There are also Sanskrit mixed songs based on the popular legends from Puranas. Some old songs, rich with lyrical quality, show the creative talents of Chettikulangara’s forefathers. The festival goes on for seven days from Sivarathri day to Bharani asterism. During this duration, the man who makes the offering teaches young boys of between 8 and 14 years certain religious rites. Early in the morning on Bharani, after the feast and other rituals, the boy's body is coiled with silver wires, one end of which is tied around his neck, and an areca nut fixed on the tip of a knife held high over his head. He is taken in procession to the temple with the accompaniment of beating of drums, music, ornamental umbrellas etc. Tender coconut water is poured on his body,till they reach the temple. At the end of it, the boy stands at a position facing the Sreekovil (Sanctum Sanctorum) and begins to dance. The ceremony comes to an end with the presentation of prizes to the Gurus (teachers). This dance if performed in pairs is called Iratta Kuthiyottam. On this day, just after mid-day, the residents of the locality bring out the floats with huge decorated effigies of chariots, horses, Bhima, Panchali, Hanuman etc. During the night, the image of Devi is carried in procession to the effigies stationed in the paddy field. This is what is known as Kettukazhcha. On the next day these effigies are taken back to their respective Kavus (place of worship of different families). "Sree Raja Rajeswari Kuthyotta Samithy"